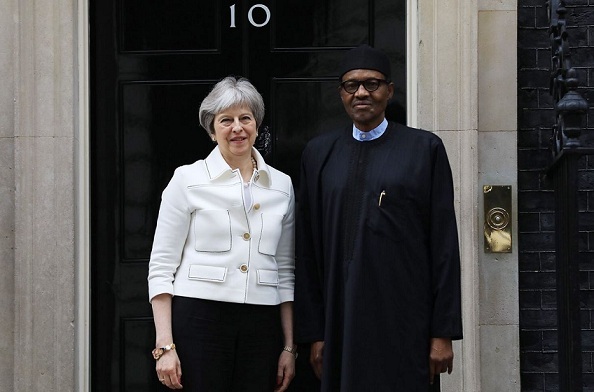 Nigerian President Muhammadu Buhari on Monday met with British Prime Minister Theresa May ahead of the Commonwealth Heads of Government Summit. Buhari arrived in London on Sunday, and is expected to join 52 other leaders from the Commonwealth member states for the 2018 forum. Details of the Nigerian leader’s closed-door meeting with PM May have not been disclosed yet, but are expected to be made public in due course. The 2018 Summit will focus on promoting prosperity, safety, sustainability and fairness with the theme: “Towards a common future”. More than 5,000 participants from across the member countries are expected to attend, drawn from governments, civil society and private businesses. Heads of government are scheduled to attend a leaders’ retreat on Friday, where they are expected to hold talks on issues affecting the member countries. This is Buhari’s first return to London since returning from a lengthy stay there in 2017 for medical treatment for an undisclosed illness. The president spent more than 100 days cumulatively on two separate occasions, sparking calls for him to resign to focus on regaining his health.